It would be an understatement to say that Heather McNemar has an eclectic outlook on life. In fact, as listed on her website, some of her interests and talents are entertaining, live music, beekeeping, falconry and interior styling. An interesting mix to say the least. With a list of hobbies a page long, Heather and her family required a home that would allow them to live freely in a rural location. They chose a house plan from Southern Living, SL-598 to be exact. From there they made a few adjustments, particularly in the kitchen to suit the avid entertainers. Once they were ready to start building they handed the tools over to their father's who constructed the home for them to their specifications. While the home boasts many custom features, the kitchen is especially stunning. Its design centers around a spacious island with stone countertops and a sink for clean up. The Shaker-style cabinets are painted a crisp white and accented with nickel hardware. Unique details like the library ladder, curved cabinet feet, and beer froster make the kitchen truly custom. To accommodate the amount of effort it takes to entertain and feed large groups of people the homeowner's also installed double ranges and dishwashers. There is no doubt that this home was made for a life well-lived. A bright red front doors provides a striking contrast against the home's white exterior. Stainless steel appliances and white cabinets and countertops keep this chef's kitchen crisp and clean. The kitchen's U-shaped design provides storage options on three walls, including the large central island. Conversation and laughter can flow easily between the dining room and kitchen with the home's open concept design. An eclectic mix of decor fills the walls in this roomy living room. Custom bookcases create a book lover's dream in this home-based library. The color and patina of antique furniture adds depth and interest to this guest bedroom. The master bedroom features a coffered ceiling that draws the eye upward while also creating a cozy atmosphere. A soaker tub set amid white Subway tile creates that sought-after spa appeal in the master bath. The laundry room features a blast from the past with its 1925 cast iron sink. 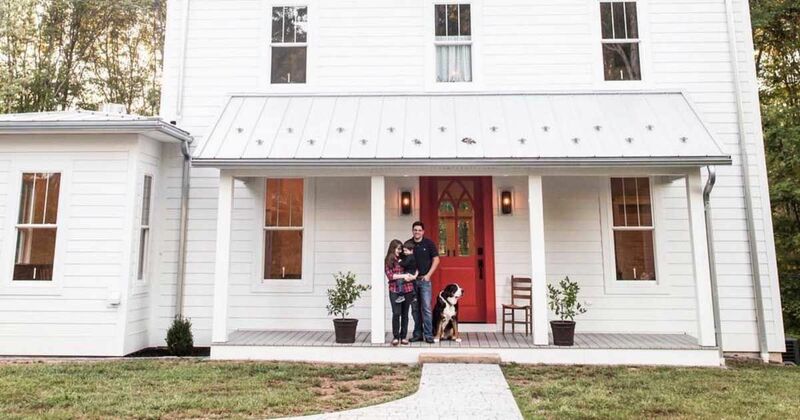 If you loved the eclectic style of this rural Virginia farmhouse then share this article with your friends on Facebook.